So you've found yourself a suitable travel adapter that will allow you to plug all of your devices into the outlets in the country that you are about to visit - job done right? Unfortunately life's not quite that simple. Travel adapters will allow you to physically plug your devices into an outlet that it was not designed to fit. Useful, but that's all it does - travel adapters do not change the voltage or frequency of the mains supply. In the US the mains supply is specified as 120 V + /- 5% and your electrical devices will probably function quite happily on a voltage in the range 114 - 126V. If you are travelling abroad and the local mains supply is in the range 220 - 250V then you will need to check if the devices that you want to take with you are compatible or not. Take a laptop as an example, they are designed for travel and will often be marked (maybe on the power supply) 100 - 240V 50/60Hz. The same is often true of phone chargers, shavers and the like. If the devices that you want to take are not specifically marked like this then you can be pretty sure that they are not compatible and you will need to do something about it. If you plug a European hairdryer (designed to work on 230V) into a lower voltage US outlet (120V) it is unlikely to work well if at all and you may damage it as well. If you plug an American hairdryer (designed to work on 120V) into a higher voltage European outlet (230V) you can expect fireworks - very dangerous and not recommended. 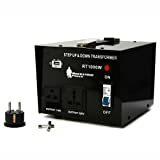 If you need to take devices to an area where the mains supply is 220 - 250V you will need to get a step down transformer / converter to power any devices that are not fully compatible. Although these two terms are often used interchangably there are some important differences that you need to understand in order to ensure that you end up taking the right kit. To check local voltages around the world you can look at our voltage map of the world. Alternatively we have more detailed informaion if you search by country. These pieces of equipment "convert" voltage in different ways which in turn affects (amongst other things) what type of devices you can plug into them. Mains electricity is a sine wave, on a 120V supply the voltage will rise smoothly from 0 - 120V then drop to negative 120V before rising back to 0. This is one cycle of the sine wave which happens 60 times per second so the supply frequency is 60Hz. In order for a transformer to change a 230V supply into 120V it reduces the amplitude of the sine wave by roughly half but it still remains a true sine wave. A voltage converter on the other hand effectively "chops" the peaks of the sine wave off. That results in a chopped wave that approximates 120V. Electronic devices that have circuits and chips such as TVs, computers, chargers etc. require a power supply that is a true sine wave so you have to use a transformer to power them. Simple electric devices such as heaters and simple motors are more tolerant and can be run on the chopped waveform so you can use either a converter or a transformer. When choosing a converter it is generally recommended to get one that is rated at 2 - 3 times the wattage of the appliance that you want to plug into it. That means that if you have a device that says it is 35w you should get a 100w converter to have a safe margin. Many devices draw more power on start up than in normal use (see what we found out about hair straighteners) and you have to accomodate this. Converters are often a good choice for the traveller with one or two low powered electical devices that are not dual voltage. 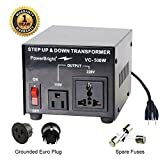 When choosing a transformer it is necessary to get one that is rated at a minimum 25% higher than the device that you are going to plug into it. Transformers should run happily for extended periods of time (overnight) at 80% of their rated capacity. Many devices draw more power on start up than in normal use and you have to accomodate this so always build in as much margin as is practical and you can afford. 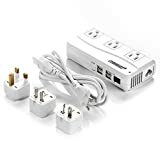 For this reason it is generally recommended to get one that is rated at 2 - 3 times the wattage of the appliance that you want to plug into it. High powered transformers are generally not practical for travellers due to their size and weight. They may be the only option however if you have critical pieces of equipment that you absolutely have to take with you such as medical devices. AC frequency refers to the number of cycles or times that the current reverses direction in a second. In the USA & Canada the supply frequency is 60 Hz whilst in the UK, Europe and most of the rest of the world it is 50 Hz. A transformer will only change the voltage, not the frequency. There is no practical way of altering the frequency of a supply. If the country that you are going to operates at 50 Hz it makes little practical difference as most travel appliances will run at either frequency. Some items with motors, such as hairdryers and some clocks will run at a slightly different speed than intended but it is not likely to be problematic. Check your device - it may say 50/60 Hz which indicates that it is compatible with either frequency. If you are in doubt or have expensive equipment check with the manufacturer first as some equipment may be damaged by running on an incorrect frequency. Devices that will need to run on the correct frequency include ones that need to convert to a DC voltage eg cameras / camcorders that have integral battery chargers. Here is a useful discussion on the effects of different supply frequency. It is quite common to find these 110 / 220V shaver outlets in hotel bathrooms across Europe. They are designed for low power devices such as shavers only (less than 15 watts). Do not plug in high powered accessories such as hair dryers as you will trip the circuit breaker and may damage the appliance. You should never plug any voltage converter or transformer into these outlets. Surge protectors and UPS (Uninterruptible Power Supply) deisgned for use in the US should not be used in countries with 220 - 250V mains supply. The network is set up differently and you may damage your equipment even when using a voltage converter or transformer. This means that domestic power strips with integral surge protection should not be used with an incompatible mains supply. Instead you should purchase a suitable surge protected adapter designed for the job if required. Where these are available we have specific recommendations if you search by country. Japan operates on 100V which is technically not compatible with US appliances as it is too low (US voltage is currently specified as 120 V + /- 5%). The difference is however small and many appliances will still work perfectly well. If you have sensitive or expensive items such as medical equipment or computers you should check to see if they will work. Items such as these will often specify "100 - 240V" either on the equipment or the power supply (if it has one). If not then you may need a special transformer to run your equipment even though a plug adapter may not be necessary.